Throughout history, religious and sacred structures have been established as significant places where architecture, culture, and symbolism meet. Whether a design serves as the embodiment of a specific religious doctrine or a more broad representation of spirituality and culture, the resulting interpretations can be a fascinating glimpse into the values of place, people, and ideology. 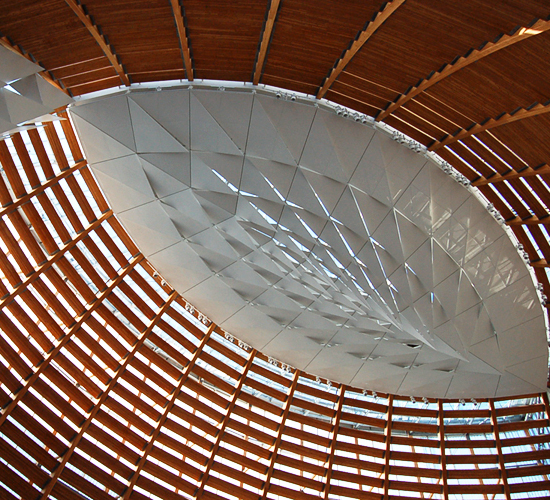 A recent interview with Craig Hartman, FAIA, of SOM and Rev. 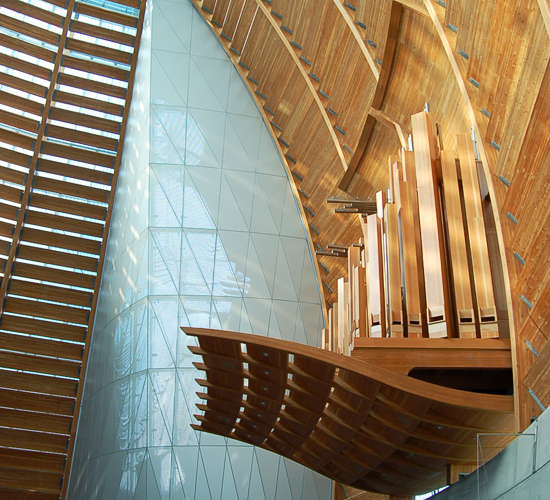 Paul Minnihan at the website of the AIA, California Council, brought back imagery of a trip to the Bay Area last year, where we had the opportunity to visit the Cathedral of Christ the Light, completed two years ago in downtown Oakland by SOM. Learning a bit more about the process and program from the viewpoints of both key participants provided further insight into the intent and function of the structure and how that intent was implemented through architectural elements and critical design decisions. As noted in the article, authenticity, light, and history were fundamental driving forces in the development of the design solution. The result of the collaboration between Church and Designer is architecturally impressive, in terms of form, innovation and material. From a design standpoint, it's quite stunning. On initial approach, the structure feels contextually appropriate, given the surrounding urban landscape. Grounded by a thick concrete base at the entry level of the building, a gently curved glass structure soars above, providing a distinctly modern and high-tech aesthetic not typically associated with traditional religious architecture. The transition of materiality from exterior to interior is distinct, as the concrete and glazing gives way to an equally dramatic, highly textural space, characterized by the gentle filtered light entering through the wood slats cladding the interior walls. Regardless of one's religious or spiritual beliefs, it's difficult to deny the inherent beauty created by the careful application of materials and forms. The result is a physical interpretation of abstract concepts within an ever-changing cultural, social and political context that represents the intent of the structure and conveys the metaphor of light through technology, historical reference and an approach based on collaboration and innovation.